Available only at The Container Store, the Platinum Easy Hang Standard simply hooks onto the Platinum Elfa Top Track - there's nothing more to it. Now add Ventilated or Solid Shelf Brackets and other components. Platinum Elfa Easy Hang Standards is rated 4.9 out of 5 by 185. Rated 5 out of 5 by Pips from Container is ALWAYS the Best in Organizing Would not go anywhere else for ways to organize closets and storage areas. There products are THE BEST. They really stand the test of time. Rated 5 out of 5 by roni143 from Can Hold Anything This is a quality & dependable elfa product. It’s been moved around twice between rooms in our house, and it sure holds up well every time. Rated 5 out of 5 by ErinM from We now have three Elfa closets that we self-installed. The salespeople were very helpful with our design process. Once the plans are set, ordering, picking up and installation is quite simple. We are considering future Elfa projects for other areas of the house. Rated 5 out of 5 by rel83 from Easy to install We installed 7 Elfa closets in our house. Super easy to install the hanging standards. Slide easily along the track. 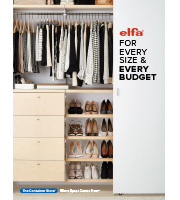 Love our Elfa closets! Rated 5 out of 5 by newclosetfan from Revolutionized our closet! We were struggling with a 7.5ft reach-in closet where only about 3.5 ft are easily accessible from the closet opening. We only had one top shelf and one rod spanning the entire closet. This often resulted in a huge mess and things getting forgotten in the hard to access "hidden" part. When we discovered and installed the Elfa system, this totally changed our lives! We were able to arrange the top tracks and easy hang standards such that we essentially created a tiny walk-in-closet, with two hanging rods (in each of two sections) whose height could easily be adjusted calibrated for the height of the relevant items. Not only are we able to hang everything we used to have in our closet and see each item easily, we also have space left over for extra shelves and an area for shoes. Other Elfa components in the pictures include: easy hang top tracks, 12in brackets/shelves, 18in hanging rods, 12in bracket hooks, double rails, utility shoe rack and utility baskets. A small note that we installed the system ourselves, which was fairly easy but proved a little tricky to do on our slightly uneven walls. This has totally changed the concept of choosing clothes to get dressed in the morning, making it easy and quick! Rated 5 out of 5 by Lightnin from All of the elfa wallhanging Systems are phenomenal - from getting the exact measurements before leaving the store to ease of installation -- it's "all good !! Rated 5 out of 5 by JJNO from Easy Installation This ELFA system was a breeze to install, with only 9 wall screws needed and then everything else snapped into place. The finished product looks great and is the perfect solution for this long and narrow closet. Rated 5 out of 5 by NancyN18 from Look out for baseboard Fortunately we allowed enough clearance from the floor and did not have an issue. When providing measurements to the closet designer be sure to note any dimensions related to baseboard. Rated 5 out of 5 by VnjRN from Great Custom Closet The whole closet was perfect. I had it designed in store exactly to my specifications. It took only a few hours of DIY installation. The anchors were the hardest part, but once the standards were placed, it came toget in a snap. Love my new closet! Rated 5 out of 5 by Mina2 from Best purchase ever Love my new closet, it was easy to put together and I know have room for a my items Thank you Carol for your expertise. Rated 5 out of 5 by catsandroses from this is just perfect! I LOVE the product, my pantry looks just so organized and perfect. I have many of these throughout my house. the quality and flexibility of this product are truly wonderful. Rated 5 out of 5 by Andra from New Elfa User Just had the Elfa system put in my closet and I couldn't be happier. Everything is so organized and I have so much more space to put all my things. I love that it is totally adjustable and think this will be a selling point when we sell our home in several years. Rated 5 out of 5 by TiffL from ELFA ROCKS! I renovate and design condos, and this system was recommended to me by a colleague. I have used it in every property since. Clients always love it. It's adjustable, looks very polished, and is extremely strong. When my team of contractors first installed these hanging standards, they were really impressed with the quality and functionality. Would definitely recommend this entire system. Rated 5 out of 5 by KJMVW from Easy to hang, love it, I got rid of two bulky bookcases using this system. Rated 5 out of 5 by 1sthome from Best purchase ever! This was my first time purchasing, installing and using the Elfa system. One of the designers helped me design a system for a hall closet that fit perfectly in my budget. It was so much fun designing it and so easy with the step-by-step instructions on installation. I am beyond pleased with the results and I can easily access everything in the closet. It went from everything stacked haphazardly to looking super sharp! Rated 4 out of 5 by LindsOmaha from The Elfa system is great, and easy to install. Remember to measure above your base board (if applicable). I think an additional length needs to be added between the 60'' and 84'' hangs. We had to cut ours to 75'' to meet our needs. Luckily we had the tools to do this. Rated 5 out of 5 by Foxandbones from Great addition to our kitchen! My husband and I were looking for a stylish way to add extra storage. The stainless steel design matches well with our appliances and the installation was fairly painless. It took my husband and my father about an hour to assemble and install. The only issue I've had is with the hooks, I've had one snap, but other than that it stays super clean and is very functional! Rated 5 out of 5 by Anastasiia from Best purchase ever We redid our clothes closet and this Platinum elfa Easy Hang Standards fit perfect! Also easy to install and they are strong! You can customize them, put as much shelves or hooks as you want. Modern style. We are strongly satisfied with this purchase. Thank you Elfa and The Container Store for Great Ideas and Perfect Cusomer Service! Rated 5 out of 5 by harjo from We bought the pieces we wanted to make a closet. They are well made and sturdy and fit well together. We love it and have ordered the parts to make two more closets in our home. No comparison with the similar stuff in the big box hardware stores. This is much better and you can get any kind of shelves, hooks, etc., that you could want. Rated 4 out of 5 by Uribella from easy to install Once the rail is install the elf easy hand was easy to install and move around as needed. Rated 5 out of 5 by bbk0415 from Love the Elfa system the elfa system is very easy to install and has the possibility to change if you ever need more drawers or shelving. Rated 5 out of 5 by DFHANDYMAN from High quality and well finished The entire elfa closet system, not just the hanging standards, are high quality, strong, well finished and easily customizable. After visiting my nearby Container Store to see the product, I designed my own closet system (no help needed) for a large walk-in closet about 5 ft by 20 ft. Online ordering was easy and delivery was made in about 8 to 10 days. The online video installation instructions were easily understood and well organized. Excellent product. Rated 5 out of 5 by DeborahC from Elfa = Excellence I have purchased just about every Elfa product and installed or assembled most of it myself. The craftsmanship and quality of these products are always excellent. They fit together precisely how they are supposed to, and they are beyond durable. They are also really simple to install or assemble and require only the most basic tools. As an aside, all of the service people I have worked with in the store in Corte Madera have been soooo helpful and knowledgable. I love going there, even if I don't purchase a thing!!! Rated 5 out of 5 by teenqueen from Elfa Custom Desk System I remodeled my room around the Elfa system and it works great. I absolutely love it. At first we were skeptical about the security and safety because of weight but now that it is finished I have no doubts and am amazed and would definitely recommend this product! Look below for my finished product. Rated 5 out of 5 by HICK from 5-STARS WELL EARNED Having purchased Elfa products over a period of several years I have never been disappointed with product or service by Container Store either in-store [Plano] or online. Rated 5 out of 5 by TriciaD from LOVE IT Love all of the Elfa closet products. They are easy to use and install. Rated 5 out of 5 by Hmrtraveler from easy to install Love the ELA system. I installed it myself. Once I hung the top rail, no more drilling or screwdrivers needed. These Standards attached very easily to the top rail, just as it showed in the video online. They slide very nicely to position where you want them. Rated 5 out of 5 by NN38 from easy do-it-your-self installation I have now purchased 2 sets of shelves and one complete pantry set of shelves. The pantry set was designed with in store help. Excellent! I now live about 180 mi from the nearest CS so the 2 sets of shelves were purchased on line. Service and delivery was prompt and complete. Installing these ELFA shelves is easy and fool proof. Rated 5 out of 5 by RenovatorKJ from Excellent Refit! I salvaged a lot of 10 year old Elfa from a master closet redo and decided to refit it into other closets in our home. With bolt cutters and a few spare parts (new drywall anchors, a couple of standards and a top track) I have now completed 3 large closets that look great! So easy to install yourself! Thanks for making such a timeless and durable product! Hi. Is this a pair or Just one? Also how much to have 2 of the 60 inch cut to 79? Also need the hanging track ( forgot what it&rsquo;s called 24 inches wide. Are the hanging &quot;slots&quot; on both ends of the standard? Hanging standards only have slots on one end. They do come in different lengths and can also be cut. Retain the piece that has the slots to insert in the slots on the top bar. There are accessory pieces that allow you to screw standards to the wall if you choose not to use the top bar. I have done that to create a small shelving unit for an art room. The pieces I used had the slots removed. Are the 60-inch standards long enough for a typical 'double hang' section of clothing? i.e., just two shelves and two closet rods. Just wondering if I absolutely have to go with the 84&quot; standards in this situation. Yes. However, other situations sometime require 84&quot;, e.g., shelf above hanging items. Can you use different standard lengths along the same wall? For example I have 4 hanging standards (longest ones) on one wall, 2' apart. I only have 1-2 shelves high up on one section (at one end) and want to put a cabinet or mirror there. Therefore it would be easier to have a shorter standard there just for those high shelves so the cabinet or wall mirror can be flush against the wall without a standard there. Hope that makes sense! Wasn't sure if it would affect the stability. yes, you can add different lengths. Is it possible to get the White Elfa Easy Hang Standards in lengths taller than 84&quot;? We have high ceilings and would like to make the most of our vertical space. Do these come longer than 84&quot;? do need to purchase a separate top track or does this come with it? Is there a guide for number of standards needed? I am adding to a closet and just looking to put up a couple of shelves approximately 80&quot; long. I don't see a recommendation for a gap between standards. I see there is a gap required if you are going to use the draw units, but what would be the minimum gap recommended if I am not considering them? For the 80 inch top rail, I used 4 standards and space them about 24 to 26 inches or so apart. It also really depends on the configuration of shelving, drawers, and hanging rods you want, so I would map it out or have them draw up a plan at the store to see what will work best for what you want. Can the components be painted? I would like to paint mine black. Can the standards, brackets, and covers be painted with a spray paint for metal? Do they need to be primed first? We do not recommend painting and of our Elfa components. The epoxy-bonded finish is not compatible with paint or other finishes.